I arrived at the UCSD La Jolla campus just as the planned rally began, picked up a sign and joined over a hundred striking employees and supporters. High noon on a hot day and suddenly there was a sound of drums and approaching people and notes played on a conch shell. The energy rose palpably as we were joined by over a hundred chanting, sign carrying students. Now three hundred strong, we marched across the intersection, bringing traffic to a halt, all of us protesting the carpet bombing of our UC campus by the very people—the University Board of Regents—who should be protecting it in the face of State budget cuts. 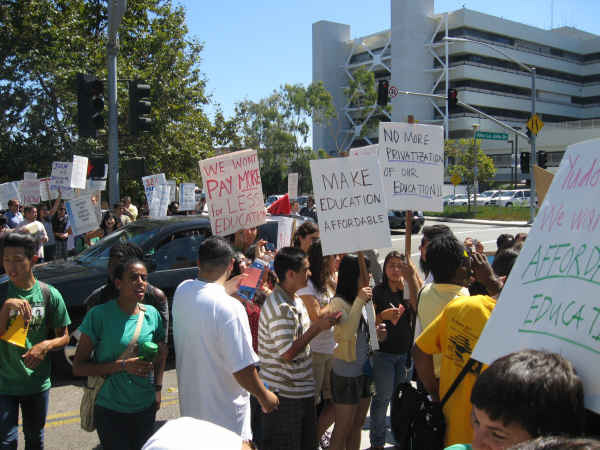 These State budget cuts, which account for only 14% of the UC system’s budget, are being used to “legitimatize” their ongoing effort to bust the unions and push our public university system toward an expensive privatized model run like a corporation. While staff, students and faculty will bear a disproportionate amount of the pain– mandatory furlough for employees, many in work units without a contract for over a year…. a 32% increase in student tuition and fees for students… staff layoffs– chancellors have received salary increases and excessive benefits. UPTE has been without a contract for over a year; there has been retaliation in the form of layoffs against UPTE bargainers; the University has not provided financial information, particularly in the area of raises which are built into Federal grants but not provided to employees; and that furloughs are illegal without a contract. One UPTE member who works part time on campus- three days a week- said that the furlough amounts to a $1,000 reduction of her income. Most of us are hard pressed to sustain this reduction, particularly since there weren’t any raises before the budget tanked. The UPTE strike was held in tandem with the student strike and faculty teach- ins. At one point over three hundred students took over a walkway, knocked on the doors of adjacent classrooms and asked their fellow students to joint them. They spoke about the impact of higher tuition not only as a personal financial hardship but in terms of decreasing the diversity of the student body. Students were concerned that the humanities curriculum will be edged out by the sciences, which receive grant monies, and that UCSD will not function as a truly public institution. The day turned out to be both exhausting and thrilling. While the campus was not closed down by the strikers, MTS honored the picket line and re-routed buses during the noon rally. Union members and students stood together chanting “Whose University? Our University.” That says it all. For UPTE to schedule a strike advertising their labor grievances for the day of the rally protesting budget cuts comes across as political opportunism. As for the budget cuts, I would prefer to see pickets at the doors of the investment banks that caused the budget crisis in the first place. George, sorry to hear you characterize the choice of timing as “opportunism”. I believe coalition building and solidarity were key considerations here. (And I think there may be a bit of the “conjugation game” at play here: I’m decisive, you’re arbitrary, s/he’s authoritarian.) And while I would also welcome your suggestion of picketing financial institutions that have contributed to the general economic catastrophe (any specific plans in mind? ), I think you missed the point that the UC Regents seem to be able to find the funds to finance raises, stipends and perks for the upper tier of administration, and to move money around from pot to pot for pet projects; they just can’t seem to figure it out how to do it for the frontline staff, students and faculty. I believe, as others have said, this isn’t so much a budget crisis as a crisis of management; UC or Yudof. Yudof has got to go. 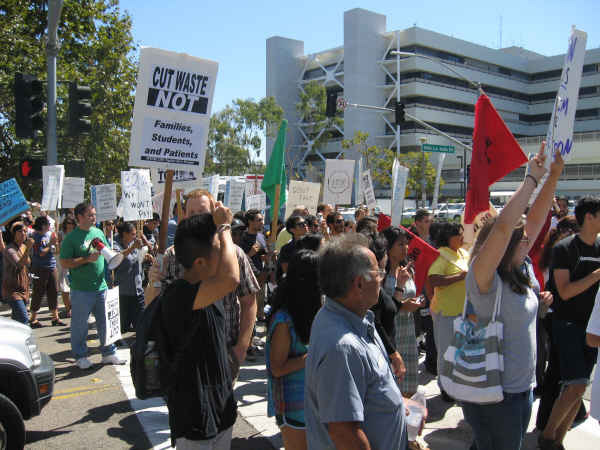 Footnote: The same day, it turns out, SDSU also had a rally to protest budget cuts. According to the Daily Aztec story, the rally was held “in light of the UC walkouts, but not in support of them.” The story describes the organizers’ position that socialism is the only solution to the budget problems, then quotes a professor who disagreed, saying he blamed diminished taxpayer and legislative support for education.